Opened as the Green's Picturedrome around 1912, seating 708. Later called the Rex, and (from 1976) the George. William Mather ran it as the WMR from around 1983. Stadium style-arrangement. Cinema closed in 2001. 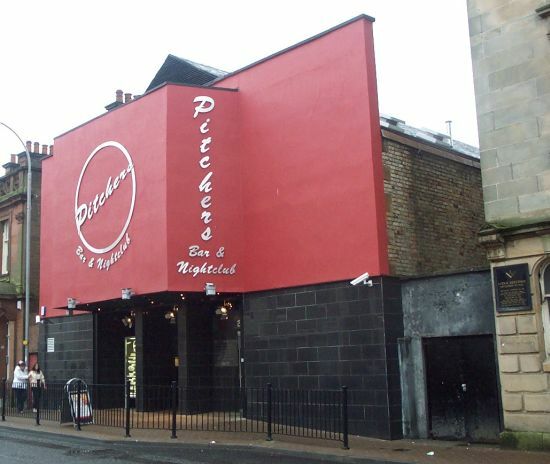 Now Pitchers nightclub, which opened 24 September 2003 after a spell of dereliction. Photo of the exterior after closure here. 3. Retirement photo of Eric Vickers kneeling, from his visit to Glasgow. L/R. Brian Kirk, Brian Kemp (2nd left back of Saltcoats La Scala/Regal), Donald Macphale Scottish sales for Rank Film Distributors, Bill Mather, Derek Cameron (Dominion Edinburgh), ??? and Roy Graham Director of sales Rank FD London HO. 4. Chief projectionist Alex Girvan passing his time between matinee/eve shows with his fiddle practice; taken in 1984. He was one of the old timers and Bill Mather took him over from George Palmer. 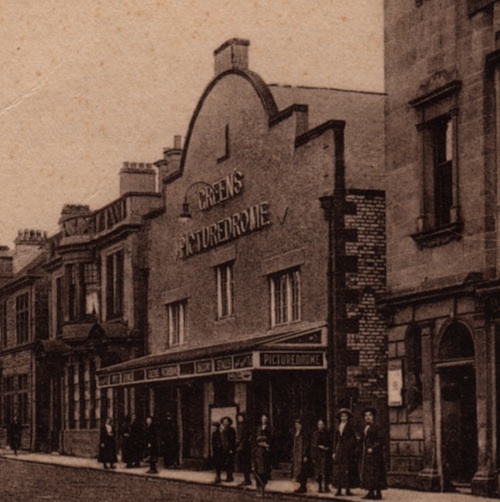 He originated from the Inverness cinema scene, & was 2nd projectionist at the "Orient Ayr" before coming to the George. 5. A view from the rear auditorium of the 35ft CinemaScope screen.This was almost wall to wall. Bill Mather sitting in the back row. 6. Photo from 1988 with the annual "underprivileged" Christmas treat given every year with the Rotary Club of Irvine. 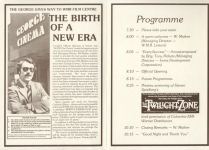 The cinema opened (along with the rest of the centre) on September 18, 1976. Originally it showed only arthouse films thanks to a tie-in with the GFT, but this was not a financial success. The last film shown there was "The Hulk" on Sunday 17th August 2003. Films are no longer shown, although the cinema can still be hired for private viewings, and the auditorium is regularly used as a theatre. Seating was 323 on opening, now 311 to give space for wheelchair users.